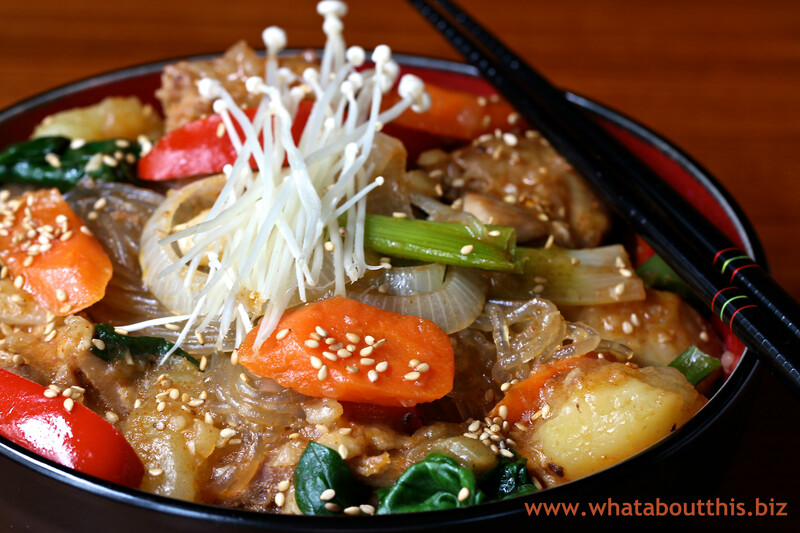 Jjim-Dak: Korean Vegetable Chicken Stew | What about this? Whether it’s a pot-au-feu from France, a goulash from Hungary, or a moqueca from Brazil, stews from around the world warm the tummy and soothe the soul. From a cookbook that contains recipes from the best Korean restaurants in Los Angeles, comes this easy to make Korean stew. This fiery and fragrant stew will definitely spice up your stew repertoire! 1. Soak sweet potato vermicelli in warm water. 2. In a large pot (or wok), combine chicken, potato, water, minced garlic, soy sauce, red pepper powder, hot pepper paste, sugar and mirin. 3. Boil over high heat for about 20 minutes with the lid on (or until chicken is fully cooked). 4. Remove the lid and add corn syrup, scallions, onion, carrot, jalapeño chile, and red bell pepper. Quickly mix together and continue cooking for another 5 minutes. 5. Add spinach and prepared sweet potato vermicelli on top and put the lid on (do not mix in). Heat for an additional 2 minutes and then remove from heat. 6. Open the lid and gently mix, then transfer to a serving plate. 7. Put the enoki mushrooms on top and sprinkle on sesame seeds to garnish. 1. Sweet potato vermicelli and the Korean hot pepper paste (gochujang) can be purchased at most Asian markets or ordered online. 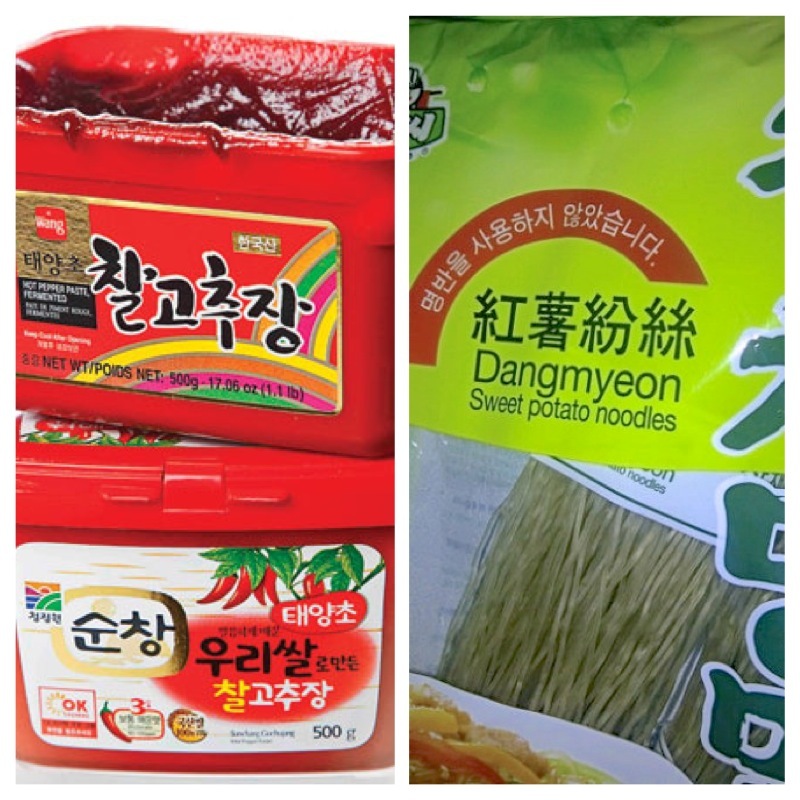 Here’s a link to a listing of online stores that carry Korean ingredients. 2. Because it didn’t make sense to use just a quarter of a carrot and because I like a lot of vegetables in my stews, I used a whole carrot. 3. I had baby spinach leaves on hand, so I didn’t need to cut them into 2-inch pieces. I used a large handful. 4. In step 3 of the directions, I turned the temperature down to medium, because it had reached a rapid boil. I wanted more time for the flavors to mingle and I didn’t want to overcook the chicken. 5. Not having authentic Korean red pepper powder, I substituted ground red pepper (cayenne pepper). 1 tablespoon of cayenne pepper seemed like a lot of heat to me (along with the jalapeño chile and the Korean hot pepper paste), so I cut it back to 1/2 tablespoon. The recipe still had quite a bit of kick. I’m not sure what the heat difference or flavor difference is between cayenne pepper and Korean red pepper powder, but I’ll try it with the authentic red pepper powder the next time I make it. I’d also recommend adding any heat element to taste. 6. I researched enoki mushrooms and found differing opinions on their preparation. Mushroom growers said to just cut off the root end, but some online “experts” said to run it under water and then cut off the root end. The Korean cookbook said, “Sold in plastic bag. Chop off the roots without removing the bag and discard,” so I ultimately followed the cookbook’s instructions. 7. I buy pre-toasted sesame seeds that I keep in my freezer. Before using, I quickly re-toast the needed amount. Toasting sesame seeds brings out their flavor. To toast sesame seeds, put them in a small sauté/frying pan over medium to medium-high heat. Stir constantly until they are a light golden brown. Pour them on a plate to cool. 8. Although this dish contains sweet potato noodles, I served it with rice. I wanted the rice to soak up every last bit of the delicious sauce!